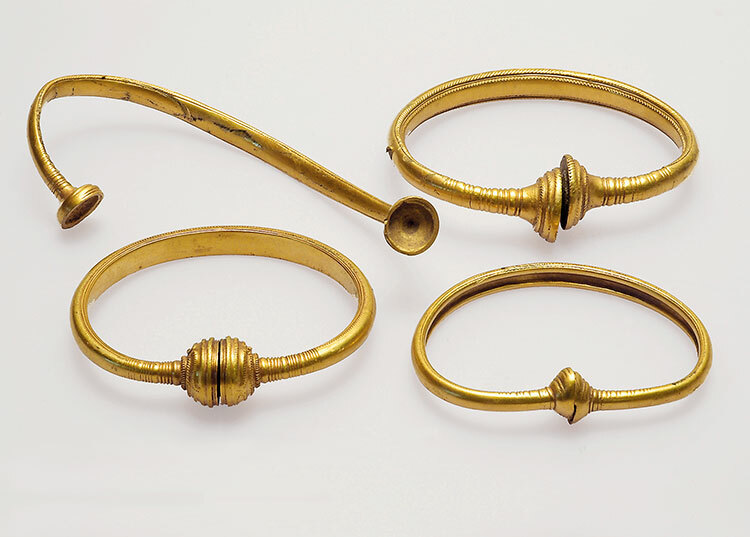 Four Bronze Age gold rings were recently found near the site where six similar rings were found in 2009. Sites on the Danish island of Zealand with golden relics from the Early Bronze Age. ‘E’ stands for oath rings weighting in excess of 200 grams. 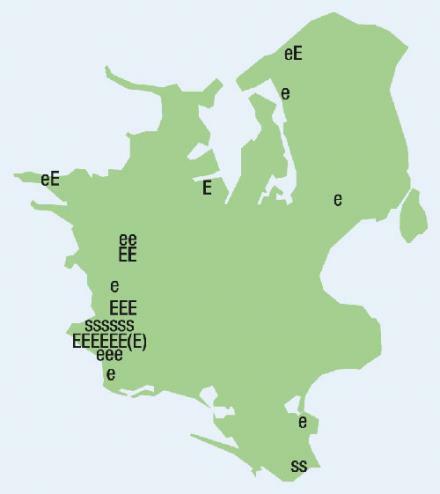 ‘e’ are smaller specimens. ‘s’ denotes golden bowls. The above gallery shows the newly-found rings in detail. A key question in archaeology is how a tool or a piece of jewellery was used and what significance it had to the people who used it. Careful observations and descriptions combined with common sense always form a strong basis for these discussions, but sometimes a little more is needed, e.g. analogies from foreign peoples or inspiration from written sources. Closely tied in with the question of how an item was used is the practice of naming. What do you call archaeological artefact? Here it is not unusual to build on what other scholars have observed and written down, which is why some of the early archaeological research terminology has undergone some changes over the years. For instance, wedges have been replaced by axes, and hair ornaments have become either neck rings or neck collars. However, most terms have remained unchanged over the years and will soon be celebrating their 175th anniversary. Particularly problematic in this respect are items from the Bronze Age, because they differ so much from what researchers knew from daily life. ’Oath rings’ are among the more special names – and are in fact the background for this article. On June 18-19 this year, Danish amateur archaeologist Hans Henrik Hansen and his nephew Christian Albertsen made a fascinating discovery. They found four wrist-sized rings with the common feature that the two tips of the rings are hemispherical, decorated and hollow. Each of the rings is very likely to be unique. Based on certain grave finds, archaeologists reckon the rings were used by men. The name ’oath rings’ was inspired by the Icelandic sagas, in which people could take oaths by a gold or silver ring soaked with sacrificial blood. The ring was found in a field by the Danish village of Boeslunde, and the location is no coincidence. No less than five gold rings have previously been found here, the latest one in 2009 – and there is also another one, which may come from the same site. A total of nine or ten rings have thus now been found in this field, making Boeslunde by far the richest finding place for oath rings in Denmark. The ten arm rings have a total weight of more than 3.5 kilos. The first six rings that were found weigh from 220 grams all the way up to 770 grams. The four newer ones are generally lighter, weighing between 95 grams and 290 grams. The discovery of four rings at the same time and at the same site enables archaeologists to compare details. The four rings share certain design features, but none of the rings are identical. One important feature of the newly-found Boeslunde rings is that they have visible traces of wear. On parts of the rings – especially at or near the tips – the decoration has either worn away or disappeared completely. This indicates that the rings were not designed entirely for the purpose of sacrifice; they had been used for some time before they were deposited. 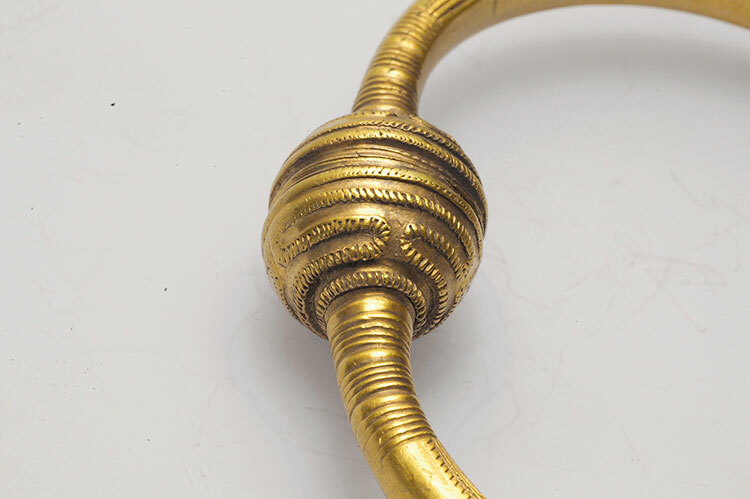 The gold ring found in 2009 has the same distinctive wear and roughly the same weight as the four newly-found ones. These four were found within metres of one another, and the ring from 2009 was found nearby, too. This means that the five rings may have been buried in the same spot, but have perhaps been dislodged slightly from their original position over the years by agricultural machinery. One of the four ’new’ rings has been pulled out of shape, and the other three bear traces of contact with ploughs or harrows. These five rings were found on a slope, and an examination of the site later this year aims to clarify whether they were found near a bog hole, like the other rings, or whether they were deposited in some other way. All of the four newly-found rings are currently on exhibition at the National Museum of Denmark in Copenhagen.